Do you enjoy a good pirate movie? Fancy making your next canal boat trip one to remember? Want to add a fun theme to your day boat trip? Here are three ways that adding a pirate theme can improve your narrowboat holiday or day boat trip. Have you ever set goals, as a couple or as a family, promising yourselves to spend more quality time together? Talk Like a Pirate Day is a good way to encourage grown-ups to let loose and enjoy silly, fun activities. 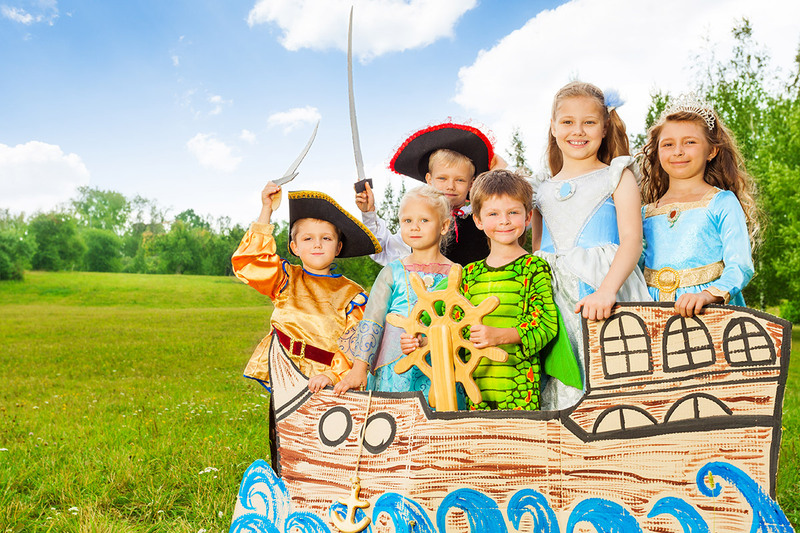 So get a few cheap props together and dress as pirates on your next narrowboat trip. Acting like kids is just one of the 5 Family Goals You Can Achieve on a Narrowboat Holiday! At the very least you’ll want to bring some sea shanty music along with you. I recommend Admiral’s Hard, a 7-piece folk band offering shanties and traditional maritime folk songs. (Our boats are equipped with a CD stereo, and are fitted with a 12v and 230v socket for charging phones and laptops). You could also bring a bottle of rum, and some clothes to dress as pirates or mermaids. Invent new names for yourselves and make some pirate flags. Bring cheap jewellery and fake coins to make some pirate treasure and hide it on board the boat somewhere. Check out our top tips of what other extras to bring along when you’re boating with kids: Don’t Go On a Canal Holiday Without These 5 Kids Essentials. International Talk Like a Pirate Day is on 19th September, every year. If you want to expand your vocabulary beyond “Shiver me timbers”, “Avast!” and “Pass the grog!” check out this informative video: Talk Like a Pirate. If ye wants to check that a worthy vessel is available for your next adventurous voyage, click here me hearty: Search narrowboat holiday dates. And if ye be wanting day boat hire on the Cambridge river network for a group of up to 10 salty sea-dogs (and yes, you can actually bring your dog!) Click here: Day Boat Hire. PS. Don’t miss out on more fun holiday ideas from the Fenland waterways: Sign up to get articles straight to your inbox, in the sidebar on the right.